Niche: Helping coaches in their early stages land more clients using direct outreach. 1. Where Patrizio was before joining Consulting Accelerator. 2. What his first week inside the program looked like. 3. Patrizio’s first niche selection, successes and the feedback he got to improve. 4. How he started landing client’s and had a $1,000 day. 5. Patrizio’s short-term goals for his business. 6. Why he is focusing on customer results and laying the proper foundations. Let go of what you think your business and life are going to look like. Nick Hauser:	Welcome everybody, Nick Hauser here and in today's interview I want to be sitting down with Patrizio Pezzutto and Patrizio was working as nine to five job back in January of 2018 and planning to quit at that time. And when he did, he was looking for a way to start a business. He had been involved in some online marketing space, but he was really looking for a way to kickstart a business and get those proper foundations. So we joined consulting accelerator and then over the last year he's been, you know, working through the program, really iterating and improving on what he thought he knew, didn't know, making some changes to ultimately get to the point now or December of 2018. He close out the year having his best month yet landing five clients and you know, even how to $1,000 a day. So this is a really cool transformation because, you know, we get different levels of people as you and I were discussing on the interviews, um, you know, some people who have made like eight figure, some people who are at a hundred grand a month. Some people who are under that and some people who are brand new in the training and have gone through this transformation and overcome a lot of things that may be some early members are doing right now. So I'm really excited to jump in and see exactly how you're able to do this and some of the challenges you overcame so it can help everyone else. So how’s it going n Italy? Patrizio Pezzutto:	a bit cold? It's winter. It's going great. And thank you for having me here. Nick Hauser:	Awesome. Okay. So you're working that night to five job like you know, almost a year ago now. What were you, where were you working? Patrizio Pezzutto:	Uh, yeah, I, I, I call it a nine to five job will do. He wasn't quite a traditional nine to five job I was working for an American startup, actually didn't online into patient company. So many similarities with consulting.com and because of they wasn't actually that bad actually really enjoyed it at that company meant a lot to me in terms of my growth as a person, as an early stage entrepreneur, very much like consulting.com. So it was a good job, you know, it was being paid well and I could work from home and uh, you know, take some trips to the states every now and then. So it was a very good job, uh, only now considered, but I, I just had this calling, you know, to, uh, wanted to try and do something on my own. I felt that that was really the journey that suited me the most because, uh, I like to, you know, just I like to try out my ideas, whatever they are, whether they're small or big and this is definitely the biggest one, uh, so far to start the business and grow it to multiple six figures. So, um, so yeah, I decided to take the leap and uh, and at the beginning of last year. Nick Hauser:	Nice. What exactly were you doing there and what was the company you know, providing. Patrizio Pezzutto:	Yeah, so I was actually in their customer service team. The company provided a old kinds of lifestyle coaching, you know, everything from mindset and spirituality, but also some practical of business opportunities. Very simply, you could become an affiliate for this company. And start your own online business by reselling their products. So this was great for someone who never had a business before and really help them kick, started their business without having to do, put together their own product. And uh, yeah, I joined as a student and a few months later they actually hired me and sparked up there a customer service team. They actually didn't quite have one at the time I was, I was one of the first people they hard for that road. And within a year or so I became the manager of that customer service team and the. Yeah. So that was my role over 2016, 2017. Nick Hauser:	Okay. So then, so you leave that job or did you join the program while you were still at that job? How did that look? Patrizio Pezzutto:	Uh, yeah. Uh, I actually made the decision to create the job around September 2017. And I said the decision was already made by transition from full time to part time for a few moms. And it was within that period that a sam ovens is webinar showed up. Uh, I came across it. And the funny story is that it was pretty random because I think I just came across a picture of him with Tai Lopez on instagram. Right. And um, Nick Hauser:	was the one that twisting the arm. Patrizio Pezzutto:	Yeah, yeah, exactly. Exactly. And there was something about this story and I'm really ready at all, which, you know, it really doesn't happen to often on instagram to read a whole post and um, and yeah, so I signed up for the Webinar and that was the beginning of the journey. That was around December 2017. Nick Hauser:	Nice. So right away when you joined, what was the first thing you remember happened next as far as the information you heard about? Or maybe the first thing you tried to do kind of just touch on you. You're like, you know, first first week in the program. What did that look like? Patrizio Pezzutto:	I remember it because I was in London. I lived in London for awhile. Do at that point. It was already back in Italy. And um, my initial idea for, for the business I wanted to build was with a, a business partnering London. And so I was over in London and I was going through the first week of the program and I was telling my business partner, did you know, just banked all of these monuments program, I don't know if it's the right thing, but I really saw something different in Sam's Webinar. You should check it out too. And then as I was going through the week at, during that time in London, like everyday I was calling my business partner and I was super excited and one of things I told him was, I really think this is like another level of education. Um, and at that point, as I said, I was coming from a company that provided educational programs. Patrizio Pezzutto:	I had some of these other, not going to mention the names, but you know, some of the other gurus in the Internet. We had taken some of their programs. So, um, it wasn't the first program I came across by just felt that the, the way Sam just gives you such a thorough understanding of each and every topic. He covers all the way from the foundations to the mindset stuff. Um, yeah, it just blew me away right away, right. I, I, I truly believe the first week of the program should be a compulsory for anyone who wants to start any business. I, in fact, I watched it twice so we're in the last year for the full week. So, um, yeah, I just felt like it was next level compared to everything else I've been through up to that point. Nick Hauser:	That's a good point too because a lot of people mentioned this and it's like you're either all forward are all against it and some of the course maybe you've been through, I've seen other courses out there, everything's very short. The video is very short and the kind of thinking is, well nobody will sit down and watch like a video that's an hour. Nobody will sit down and watch a 30 minute video or a two hour video. Like they just don't do it. They got five, 10 minutes. They're busy people, you know, we're all busy people in 2018. That whole thing that people spit out a lot. But you know, like when Sam created that program was stigler member. I'm saying like, I'm just going to make this very long because what the truth is is that if people are sending out and start their businesses, they're going to need to be able to focus and there need to be able to sit there and learn this information and if they do take that upfront time to invest, there was also come quicker versus you watch a five minute video, you run out to try to do something and you're like, oh, I don't know what to do and just fall in your face even harder than maybe what initially. Nick Hauser:	So why did you like those like longer videos and the in depth information as somebody coming in and starting out fresh. Patrizio Pezzutto:	It wasn't necessarily the length of the video that stood out to me. It was more like how as I said, you know how a whale explained everything was like, it doesn't just say, you know, how does this, how you start a business, you do one, two, three actually takes you through why you should, you know, to thoroughly research your niche. Why should really, you know, think about your offer and your message and even past week one, you know, the mindset training you really takes you in depth into the reasons why we basically do anything in our lives and why, you know, society goddess, to think about ourselves and our life in a certain way. And either the of transformation can happen if you just take pills of knowledge every now and then, um, you know, it needs to be a toro consistent and long enough process, you know, because otherwise the, you know, the strings of your past, a bad habits always gonna pull you back to where you were. Patrizio Pezzutto:	And uh, and also there's a feeling of, of um, you know, I've got the consulting accelerator box. I always know where it is in the room and you know, at every time that I mean doubt might think, you know, maybe I'd done no, you know, who am I to want to start a million dollar business? Right? But then I think, wait a second, you know, I, I got all of that inside here, right? It might not, I might not remember it all. And my forget important things every now and then, but I've got it like I've made that investment in my life to go through all of this knowledge and now that belongs to me and how I'm going to use it, how it's going to unfold. I do not know, but I know that, you know, I know that I know that much and I know that I still have to learn a lot, but you know, that much is already there and it's like, you know, sort of also has the shape of the breaks to really people like a brick in the wall of my business and my life. Nick Hauser:	Yeah, that's a cool, cool metaphor. So in week one to, you know, you mentioned a couple of things. What for you is like the most powerful thing that stood out that was really helpful? Patrizio Pezzutto:	Many things, it'd be hard to say just one, but I would say the science, uh, you know, really understanding the business as a science and you know, you don't just go out with an idea and start a business, you know, there's a process they you have to follow and you need to begin thinking about, you know, what, what is it that your customers might want and need and ask them first before you even start with, with your plan or big idea in a. and you shouldn't even be attached to one specific idea until you've spoken to enough people. So I think that that's an important distinction and it's really an important lesson because I think you see how many people just start businesses, you know, programs like shark tank or this kind of things. They see all kinds of people that just come up with amazing ideas all day are they're just ideas in their head and one every thousand my actually workout. But the truth is that it's much easier to just go out into your audience or what do you think is your audience based and ask them what is it that you want? What is it that you need? Nick Hauser:	That's a great point because not only, you know, Samsung made a video on this, on our latest blog post and that was one of the first things he says that was most important thing, you know, that video was, you know, what I wish I knew like nine things you wish you knew when I was when I was 20. And that's like the first thing. Um, and I see a lot of people, even though we had that training, so a lot of people come in still only say I'm really passionate about helping. Like, you know, I'm really passionate about doing this kind of service or you know, I really want to help these people do this thing. But then when you ask them, oh, you know, that's awesome. Like, have you, have you spoken with them yet? And they say, well no, I, I kind of know what they want. And then it's like, Ooh, we should probably just go double check, just go. Patrizio Pezzutto:	Sure, yeah, Nick Hauser:	you might be right. Maybe the perfect thing that you may not be. So for you as you're going through here, you know, what was like your first kind of action steps you were taking in the first week or two of the program? Patrizio Pezzutto:	I was taking them all as, as suggested by Sam, so the worksheets and really taken the time to print them out. If I don't feel like have an answer yet, just leave it, come back to it and rethink about it. Because if you don't have the answer to one of these questions, chances are you shouldn't keep it. You should really think about that question because it's highlight a gap in the process. And so that was, I've been through that process at least seven, eight times throughout 2018 meaning going back to we are week one, um, or at least through the worksheets and were thinking about it, which is something summations in week two things, you know, the master algorithm. So you have an idea, you take action and then you observe the results. And analyze the feedback so that cycle repeated about seven, eight times throughout 2018. Patrizio Pezzutto:	And um, and so these were the actions I was taking all the worksheets, um, in terms of week two. I mean, it's hands down my favorite week because it really, um, you know, it's not just business anymore, it's your life in general and you're really challenges you and pushes you to sort of forget everything you thought was true, to redefine yourself, what's true for you. And I think that's possibly the biggest gift you can give to someone, you know, to help them find their own truth and um, you know, redefined their current character. And I think there's great power in knowing that you can define your character if you want to be anything you can be that. And I think this is the mainstream message, right? You know, we grew up thinking we are specific, you know, identity and we grow so attached to it. And then we are unhappy because we are stuck into something that was created by someone else, you know, 10, 20 years ago. And that's a not a very nice place to be. Um, so in terms of actions, I mean, I, I think you either do something well or you don't do it. So to me, every time there was an action to take I just did it and followed the program a thoroughly. Nick Hauser:	It's interesting to hear you say that because like, you know, you did you grow up in Italy. Yeah. And so like I'm from the U S and you know, there's a similar, you know, people while there is no natural cultural differences from living across oceans and stuff. There are some things with like humans that just tend to happen a lot and that's one like being brought up and kind of being told who you are and what you can do, what you're good at, what you're not. And then if you always give the power away to somebody else to tell you, like you can do that, you can't do that or you tell them it's their fault that this happened to me. Once you give the power away to them, you've let yourself down really because you accepted that you can control anything and that's where it gets dangerous. So it's cool. Um, and that's why we do a lot of people have week too because there's like, you know, I think one of the module is called seeing for the first time and it really is like that. It's like, well, like I can do this. What was the niche that you were picking, you know, starting out when you're, you said you went back a few times, so this worksheet and such, you know, what was that process like? Patrizio Pezzutto:	Yeah. So as I mentioned, I worked for two years with a company that really pushed their affiliate model. So I understood affiliate marketing, although, and this was possibly a key mistake I made at that point, I didn't have that much hands on experience with affiliate marketing. Like I understood it, I did it. I was part of a team that essentially was helping other affiliates. So all the technical stuff was something I felt quite comfortable with. Um, so that was my initial need, nature of choice. I decided to help people who were just approaching a marketing and wanted to help them initially a one to one. Then I put together an online course. I basically skipped all the steps, that sentence for the, you know, explains it in week one, you know, don't do one to one, don't do online courses until you've done it yourself. Patrizio Pezzutto:	And nonetheless, that was my first client. My first $1,000 day happened around March. And um, you know, of course in hindsight I can tell why it was, um, it was possibly not the best choice because I was trying to teach something that I only understood, um, that, that only understood, but I, I never really put into practice and at least I never really started a business or putting my life on the line, um, and just know started the business that will basically make my income and um, helped me make a living with that business model. So in hindsight, I should, if I wanted to pursue that niche, I should have been an affiliate marketer for at least half a year a year and got results and then I could have become a coach. Um, so that was the initial idea and it gradually evolved Nick Hauser:	and coming from that job and stuff and thinking it's a good match. That makes sense. Um, how did you start? Did you, did you go on research their problems like we talked about? How important is it? Talk to them when you first got started, did you go and still talk to them or do you kind of just think, well, you know, I worked at this job. I already know what they want. What, what was that whole thought process for you? Patrizio Pezzutto:	Yeah, yeah. Bit of both. First of all, I start to speak into the people within that company will do it. They couldn't become my client. Obvious reasons. I could cross repeat clients from other companies, but these were depressed people I've interviewed. So it just got on skype with someone. Um, and I just asked him, you know, how was your experience with the marketing, what would you like to achieve, you know, what were the roadblocks and all of that. And then also went on facebook and youtube, mostly facebook. I joined a lot of facebook groups and the youtube just watched videos and signed up to different channels. And these are really two great place to begin with. If you want to just gather some information and ask a few questions to your potential audience. And so just started adding people on facebook and reading all the comments on youtube videos and gradually started to see what the common um, problems to come desires, common roadblocks were. Patrizio Pezzutto:	And steel once again, in hindsight, it's easy to say when actually ended up putting together my program, I basically just put in everything that I thought was important, you know, will do. I had done the research, I can see how that program was very much me teaching everything that I felt comfortable teaching and to some extent that that's valuable. And I'm sure I'm actually a couple of clients were very happy with the program and um, but, but yeah, so I did the research, but when it came to put in together the, the offer, I didn't keep the. Everything I'd learned in mind. I just did what I thought was important. And so that was another very important lesson Nick Hauser:	and a lot of people are curious to how did you actually make money? What did you say to these people to get them on the phone? Because a lot of people want initially when we start telling them, well, it's important that you go and talk to people and if they can conceptually get it, like, okay, that makes sense, but how do I talk to them? What do I say to them? Like, you know, a lot of people say people might think I'm trying to sell them something. How did you come off? And just like a casual way that said, hey, you know, I'm just trying to learn some more. And then as those friendly questions over skype, how did you work that whole. Patrizio Pezzutto:	Hold on. I think it's the simplest and most important. Less than a full time. Just be honest, you know, just say, look, I signed up to the program. You don't need to mention which program and I'm, I want to put together a service and offer a product bought. I'm new in this industry and I love to speak to people who, who've been in this industry. Um, and because I love to understand what their problems really are, what their desires really are, what they've tried in the past and what they've invested in in the past, what has worked, what hasn't worked, and just ask them. I mean, facebook makes it very easy because you can call them on facebook, so it's literally about are you up for a chat? And then you just clicked the phone icon and you speak to that. And it's as simple as that. Nick Hauser:	Yeah, I'm glad you just made it simple like that because it is, it really is. And people will appreciate it too when, when you just come off genuine, like, because you're, you're basically saying I want to help you and I don't know how it can help you out, but I'm definitely open to understanding everything I can. And then that person, if they do have that problem or whatever problem they do that they're going to tell you, they are like, well, you know, nobody's ever done this or nobody's done it in this way. That's just like, you know, just this is what I'm doing, that there's no need to be sneaky about it. I think some people sometimes think there needs to be this like magical scripted, like persuade somebody to click their mouse and type back and take out their credit card or something. Nick Hauser:	So you're going through affiliate marketing, you land a client and you realize maybe it's not for you. What's the next point where you make that next leap into figuring out what the new niches going to be and the new offer. 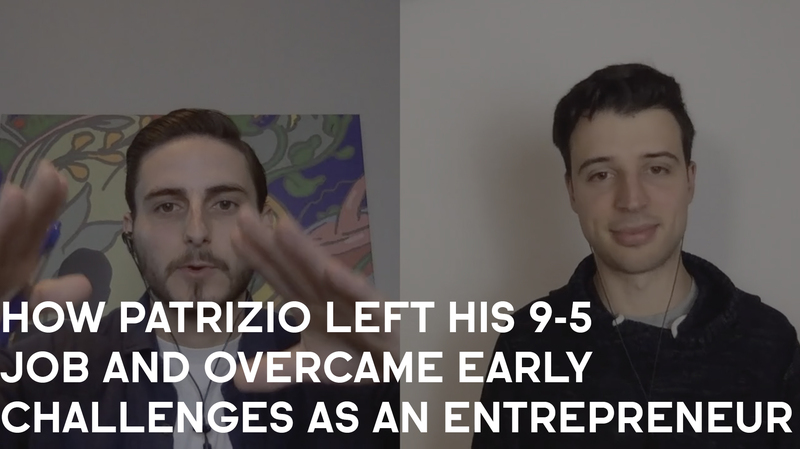 Patrizio Pezzutto:	That was a very interesting time because I, uh, you know, that was around March, April, you know, so I had the first client that I was doing one to one and that was like, no, wait, I'm going to do an online course, which is exactly what to do. But once again, um, so I spent a month together, these online courses in click funnels, you know, recording the videos and all of that, you know, my, my own version of the consulting accelerator basically. Um, and then got a few more clients. Um, you know, so that program, it was very cheap at the time, you know, I really didn't have the competence to charge thousands of dollars. I think I was pricing it at 300 to $500 and then, well around, around June what happened, I just hit the point where I just needed a break and um, and so two things happened. Patrizio Pezzutto:	First of all on the spot, I started the brand new thing completely, so I decided to start the community around, you know, mindset training or lifestyle coaching and I just went on facebook live on my profile and I just said, look, June is the last month of the first half of the year, so let's all get together. I'm going to start to communicate on workplace, which is this platform by facebook totally costs $50 and we gotten to meet everyday, live within that community and it's going to be a way us to hold each other accountable for uh, whichever goals we've set at the beginning of the year. Bought almost halfway through the year we haven't achieved yet. So that was completely random, but it worked. You know, some people signed up and there was a very exciting and at the same time I really felt the need to, to, to run away, but basically on just uh, um, you know, booked a place on Airbnb by, you're like, no for quite far from wherever they've been. Patrizio Pezzutto:	Notified a mistake, a couple of hours, drive on a beautiful lake and just basically stayed on my own for like a week without speaking to anyone. And, and I say, you know, it was a very interesting time because I think sometimes you just need to let go of everything you've planned and just let it explode in a way and just let it happen. And uh, and then what happened is that graduate Srd to pull the strings back together. And I was like, okay, this is one time I'm going to do. I'm in graduate and started to find a few more clients. And that process over a period of two, three moms lead to um, you know, basically reshaping the whole business and thinking about I'm a completely different niche. Completely different service. And other business partner came into the picture at that point, which was one of my clients. So I'm. So yeah, that was like a DD evolution and it was, wasn't it? There was no way I could have predicted that, but sometimes it just happens. Nick Hauser:	It's an interesting pivot to it. I get what you mean by it's random because sometimes if, if you don't think about why it happened or looking back, it's hard to remember there had been something because nothing just random, random, like nothing just falls from the sky for you. Because I asked this because you know, you started out, you started in a niche where you had some experience and even though maybe in the Middle East that like you didn't do things perfectly. We're landing clients. Some of them were happy with the program and then you got into half of the year, you know, what, what were you thinking about that the niche you were working in, you're like, it wasn't for you anymore. Did you not like working with them? Like what made you really think, hey, maybe there's this pivot that I can make that'll help me go even further. Patrizio Pezzutto:	Yeah, I think it's a number of things. I think first of all, I believe that inside us we have our guidance system always guiding us in some way or another so you can all leave no room for too long for so long before he actually hits you. Uh, and that, that's the whole lesson in itself to learn to listen to your guidance system and uh, and uh, do not ignore it. So I think really deep down inside there was something inside me telling me this is not your niche because you cannot ever be an authority in this niche because you haven't done it, you know, you, you just haven't been there. And, and also another coach of mine, I remember I was speaking to him on messenger and I just told him pretty much what I'm telling you. So I'm just feeling like I'm doing this thing but I don't feel like I can really be an authority. Patrizio Pezzutto:	What do you think? And he was like so brutally honest with me. And he was like, you know, if it doesn't feel any integrity, it's not going to work. And thinking back, I mean, that was a gift from him to just ride that message so clear. But at the time, imagine, you know, I had been working three, four, five moms on this thing and now it's becoming clearer and clearer that I should change the direction by adding a clue what that would look like. And then that led to, you know, coming up with this random idea and uh, going off for a week in silence. And uh, so, but I think the root cause was just understanding that, you know, uh, it doesn't matter how well presented my funnel or a script or whatever, doesn't matter what kind of strategy I could've come up with or learned to sell my product at. The root problem was that I was never going to be an authority in that niche because I simply haven't done it. So, um, yeah, it was a hard the truth to, uh, to accept. But it was one that sooner or later I had to face. Nick Hauser:	How important was it for you? Even though it wound up being maybe not right for you, how important were those first six months of just working through the action items, getting used to reaching out to people, doing sales calls, servicing clients, just everything new and starting a business to helping you make quicker progress when you pivoted, like do you think that was super helpful to you? Like if you started with this new niche back in January 18 when you joined, you know, what do you think you would able to just get as much momentum as quickly? Patrizio Pezzutto:	I think the biggest lesson of it all, like possibly from these first few moms throughout 2018 was that you need, um, like when you go for a big leap there is going to be someone or something on the other side and that's going to help you out. What that mean by that is that at multiple times throughout 2018, I was in a position where I just didn't know where the money was going to come from. Like I had no clue because, you know, I just got rid of the idea of the business I had and multiple times I even consider I'm not going to go work at Mcdonald's or something like that, you know, but every single time I was like, this close to broke, boom suddenly shows up out of nowhere. Someone I poked two, three months ago that completely forgotten about or just something you know. Patrizio Pezzutto:	And so the biggest way, I think it was important to go through these motions and why I think possibly everyone should at least try once in their life because you got to understand that even when it doesn't make sense in your head, even when you're done have a. even when there is no plan, you can trust the universe or God or however you want to call it. Whatever you believe in, you can just trust that things will work out and something or someone is going to shop to help you out any. It's unlikely going to be what you expect. So you need to keep yourself open minded enough to realize that, you know, I wasn't expecting to find a business partner in September, October. In fact, I was quite skeptical of the idea of working with someone else, you know, but just showed up and um, I mean I could recall multiple, multiple times when does this happen and I think the biggest lesson in it is that you need to learn to trust, you know, trust yourself, trust others, but also trust the bigger picture and know that if you're feeling like you're doing something that's important, um, you know, you're gonna you're gonna be held out in a way or another and uh, and the challenge and the struggle is just something you have to go through to truly internalize those lessons. Nick Hauser:	That's good advice. What also to, based on what you've been saying, have you taken that Myers Briggs test? Yes, I did. What is your title? Patrizio Pezzutto:	It's funny because I took it again because I told you now I'm going back through the program and just went back through week two in December. And um, so my type is a I, n t h a f j I nfj but I am 49 percent extrovert than 51 percent introvert. So the first lead the roots really, really batteries a lot. Um, but yeah. So could you, could you guess it, Nick Hauser:	I didn't think that Jay maybe. I mean you need thej if you told me now like what do I think you are right now in gi, but just based on what you were saying, you might have mentioned your feelings a lot and you were mentioning just to trust things, let things happen. Sometimes you have to be open to new possibilities which is more like the p, m preference because thej type needs everything planned. But it varies. That's why like you said, like the other one, you're 51 $49, it can go either way. So sometimes they're not as like as strong of a like characteristic or preference. Patrizio Pezzutto:	Yeah. And it might have been. I mean, I couldn't find my, the test I did back in January the first time I went through week tube, but he might have been a p at that time and he became a j at the beginning. Nick Hauser:	Training anyone want to, once you follow the system and everything, the Sam's later, you pretty much have to become a ga feel, like get everything and you know, it's a good thing is it's the truth. Like you can't just walk around and be like, oh, I think this will happen today. Like hope it, you know, it's all good man. I mean I guess some people can, but. So kind of getting back to your story here, how are you going out a landing these clients organically? Like where were you finding them? Like first off, Patrizio Pezzutto:	truthfully, I think 99 percent of my clients so far came from facebook for a small period of time. I was also hanging out on, on a forum within the affiliate marketing world. And so it was also doing some direct outreach over there and um, but yeah, facebook going into groups speak to people and get them on the problem. That was basically the strategy, uh, for most of 20. 18 is amazing. I did a few webinars, you know, that one would that community for June, I was a Webinar facebook lives and these kind of things and I think these lights with few calls, um, but mostly direct outreach on facebook. Nick Hauser:	Nice. And so you're going into these groups because a lot of people, they know exactly how to engineer this. They know they want to get a call, they know they want to find somebody who's qualified but they don't know, like, should I just add to the list of the group and had people or should I find people who are posting in there like that may be, is communicating that I might have this problem that you're an expert at solving, you know, what did you do? Like let's just do it like this. And He'd show up to a facebook group. What's the first thing you're thinking about doing? Patrizio Pezzutto:	Yeah, well it's fairly easy for me to explain this because this is the service we are now offering to our clients. So we're just in the, and I'm just today I was sort of re in it, like it's 10th version of this process in its simplest form. You just go into groups and you as strongly recommend you look at the posts you've done. Just add people at random from members because you have no idea when they joined, if they're on facebook, they're engaged and all of that. So I would strongly recommend just go through the post. At one point I was even taking screenshots of the post and just saving it on the spreadsheet so I could make reference to it. I don't really do that much anymore and then think it's too important. Um, but anyway, that was something else I was doing and uh, yeah, just that in these people and uh, and then I will just engage in the conversation now a big breakthrough for me, a big, um, you know, I will say additional element that I added to the strategy is to start my own facebook group. Patrizio Pezzutto:	And to actually simply invite people to my facebook group because that is a great way to begin to conversation if you're doing everything organically running and trying because if you just add people and try to speak to them and try to get them on the call, you trying to do few too many things at once, you know, if you've, if you've been through the program, but obviously if you know a little bit about marketing, you know, that takes time for people to get to know you, like you trust, you know, seven to 12 times. They need to see you seven to 12 times before trusting you and all of that. So to try and do all of that within one chat in messenger, it's very hard. It can be done, you know, that's how I found my first clients. But I realize that if I invited people to my group, then first of all, the initial interaction is super easy because I'm just sending them a link to my group and saying, you know, hey, I noticed you're into affiliate marketing guy just started the group about fit in marketing. Patrizio Pezzutto:	And I'm gonna be going live every week and you can ask me questions. I know that, so, you know, you begin to conversation with a very low low risk offer and um, and you've given them the chance to get to know you and you're also positioning yourself as an authority because now you're the leader of your group. You did live calls, you share value and all of that. So by the time you get back to them, maybe a few days, a few days later, um, then first of all, they might actually reach out back to you and say, Hey, I saw your live and I read like your group and all of that. But in general you need to push people a little bit, right? So usually I would just go back to them and asked them, hey, where are you on the live call yesterday? I would actually start from the people that joined the live call and you know, there were 10 of them. Patrizio Pezzutto:	I will just continue the conversation. A little trick. You can also do a watch party and the, if you guys use that already in the, in the community, but um, you do a watch party where you play back the live call you did that previous week, so it's essentially live called the now you can focus on the comments and you can focus on inviting people and you can begin to conversation there and then actually, so that's another thing you can do and only now you're going to be engaging with, with people in the group. And so at that point when you get back to them and offer a call, um, you're in a much better position and even the calls usually are a lot easier, a lot lighter and you know, you don't need to introduce yourself like from, from scratch. Uh, yeah man, they already know you a little bit. They sort of have a sense of what you do and you just need to continue the conversation. And even if they say no on the call, they're still part of the group. So they might you engage with you, you know, few months down the line, which is also very important. Nick Hauser:	Are Message is going straight to a strategy call, you know, 30, 45 minutes or is it um, like a quick chat first? Patrizio Pezzutto:	Uh, I've experimented with both bikes, usually just straight to a strategy call a I find any. I think it's a mindset shift. Like when I was offering the quick chat, how to know is sort of like you're trying to sell them, you know, it's free, but it is still sending, right? You're trying to sell them a free call free freak out, hey, let's just get to know each other. So they'd be like, okay, let's get to know each other. And then transitioning from that to a business call, I find it very hard because it's like, hey, now we're friends. We've got to know each other and now I know a little bit by you. Oh by the weight. Also run a business and have something to sell. So it takes more confidence and more courage to actually just say, look, I run a business and this is a business and I had a service to sell. Patrizio Pezzutto:	It's not cheap, but you know, it's very valuable and I'm helping people get results. If that's something you're interested in, whether you want to buy, you're not, let's get on a call and then I can tell you more details. Um, once again, I think it comes down to, comes up, comes back to the idea for being honest, not that you're not being honest with the quick chat, but you know, I think you're being more honest and more upfront if you're just letting them know this is a business and I have a service and if you want to get results, I can help you do in that, uh, you'll, you'll also need to pay me for that. And it just makes everything clearer. And if they're not up for it, that's fine. You're not wasting your time with people that, you know, might not even have a dollar in their pocket. Right? So that's, that's my current idea in my still change in future. Nick Hauser:	I think it's really dependent on, um, like your niche and the platform you're speaking to them on facebook. It totally makes sense. And if it's more of a personal transformation niche, I'm like, if you were helping women age 30 to 55, lose weight, they're not coming from a business world every single day. They're not operating in a business or they may be working at a job, but you know, they're not, they're not used to maybe hopping on calls with people and talking to different vendors and suppliers and all that. So it makes sense to just like get on a call with those type of people. But sometimes I go over Linkedin, if you're speaking to an accountant, they may be used to like, yeah, I'll hop on a quick call, a quick chat and then just see what's out. I think it's what you preframe it to, you know, if you say like, Hey, you know, this is who I help. Nick Hauser:	And you get to that initially and you say, well, let's hop on a quick 10, 15 minute call and you know, based on that call, that kind of sounds like, I think there might be some room for, for, you know, a or potential for me to help you. Um, that we can have that longer call and really make the decision together if you know, it would make sense for us to work together and uh, and I think a lot of people don't do that, so when they hop in that quick chat like you're mentioning, they kind of get in there and they just pitched the quick jet or something like, Hey, like let's talk, let's get to know each other. And then the person just thinking that. So when you're like, Hey, do you want to like do a strategy call with me? And then either service maybe, but I'm not going to tell you the price and that just like it just doesn't work. So it's like all that initial and what have you found to facebook is cutting down on the amount of people you can friend request and all these different things. So since you're in this world, what have you found to be the most effective way to operate that? Patrizio Pezzutto:	Good point. I think have a couple of things to say about this because first of all, it's a numbers game. There's a certain amount of people you can add on a daily basis without upsetting the algorithm, and that number is usually about 10, roughly 10, maybe 15. And we're doing this across multiple accounts now. So we, you know, we have a wider spectrum. Sometimes it's less than that. So, uh, one hand, what we're also doing is we're also beginning to operate on Linkedin so that at least we've got the extra source of leads. I'm on the other hand, I think there's a reason why phase, because operating this way and you know, you can take the positive side to it, which is you can only add 10 people a day, you know, they have to be good people, right? They're done. Just because I remember maybe maybe six months ago was a bit more open, I don't think so. Patrizio Pezzutto:	I don't know. But you ended up in a, in a, in a habit of just add people, just I need to add 30, 40 people and then be like, you know, half or three quarters or three quarters of bees are just very bad prospects and you know, because you've sent it by, you're in this mindset that you need to edit a lot of people. So the upside of I've been facebook, you know, cutting down on the amount of people that you can add is that it forces you to focus on the quality of the people that you add because truly, I mean, if you want to just start your business, which is what we help people with. Um, if you can get on long, good call a day, you're likely going to find two, three, at least new clients a month. And that's perfectly good number to begin with. Patrizio Pezzutto:	Um, and another thing, I think that at some point you just need to begin doing paid advertising. Um, I think the organic, which is my, my, my own, uh, you know, journey this year, you know, really want to get back into it and really master and begin learning more about it and finding the confidence to do it. So I just think, you know, that's, if you're not doing paid advertising and this conversation I'm having with myself or than anyone else, why is it, is it because you're afraid of losing money? Now let's talk about that because that's the real problem, you know? And so I think organic is great. You know, you can get your head start. Um, uh, things I mentioned is still does one, one message a day that's still true, but um, I totally agree with you. I think you should still do organic outreach because there are simply too good prospects online that are just waiting to have that conversation with you. And uh, you can get around facebook restrictions by expanding on different platforms, platforms like linkedin or Rogers. And um, at some point you need to do paid advertising if you really want to scale. Nick Hauser:	Yeah, that's good point. Just a couple quick more questions about what we're talking about. Our strategy goes. Then I want to transition to dive in into like who you help, what you do so we can. People can hear you know exactly what you help people with. Um, you said that you'll, you'll go in and you have multiple accounts. So is that like there's multiple patrice ceos on facebook, you know, what did you mean by that? Patrizio Pezzutto:	No, no, no. I was just talking about our clients' accounts. So, you know, as, as I told you at the beginning of the call, we have six, seven clients right now. So we used their accounts to do direct outreach. So me and my business partner have to. So right now I'm operating across, you know, eight, nine accounts and the numbers are similar throughout, um, most accounts of meaning the amount of people you can add. I'm not a quick thing I forgot to mention there doesn't seem to be a limit right now. There doesn't seem to be a limit on how many messages you can send a. I remember six months ago, like when you really started to send a lot of messages and messenger it will, you know, you would have that red message saying that you can't do anymore and I didn't know if he's got to do with whether somebody is a friend of yours, whether there's a link in it, but right at this time we're not experiencing that and maybe we were just been lucky over the last month or so, but, um, yes, we are very restricted restricted with how many people we can add bought once we begin sending messages, we can just send many more than 10 a day. Patrizio Pezzutto:	Um, so that's what I meant with multiple accounts that I'm operating with my account but also with my cons accounts. And so that gives me a wider spectrum of what's going on. Nick Hauser:	Then you mentioned it's a numbers game, so realistically out of those 10, if you're adding 10 everyday, how many in a week's time would actually accept your request? Patrizio Pezzutto:	That's another interesting point because about half of the people you find them facebook, uh, when you can also send friend requests to. I don't know how that works out within facebook algorithm, out the knife. It's got to do with the fact that you're doing the strategy or not, but roughly half of the people that we find a button to send a friend request and half of them don't have it. And so we will always try to friend request before sending the message Bible. So found that just sending the message to those who doesn't have the don't have it still works out and they still get back to us. Actually it's a pretty good rate, you know, so that, that's part of the system that I do not understand that just do it. And the recent we started even sending messages to those who doesn't accept our friend request if they haven't accepted it within two, three days because I feel that, you know, maybe someone doesn't accept your friend request just because they don't like your face, but they might be interested in your idea in your group. And you know, personally I've gotten those a friend request and never get back to. So just because I don't think that these people could help me. So we still send loads of messages. I'm purely, no. Tell us where your question. I would say out of those that you send a friend request to roughly half would accept and how could not accept? Nick Hauser:	I guess I'm the last couple ones I wanted to cover too is when you're looking for groups initially to find how do you identify which is the best group to dive into and started looking for people? Patrizio Pezzutto:	Um, I'll just start from the keywords that are relevant to my niche or my client's niche. Uh, one thing I try to avoid is to get into a group where does a strong leader figure because then it becomes very hard to try to become a leader for that person, especially if they're happy in that group. You know. So prime example, it could be the consulting community, you know, Sam Ovens is a strong leader in that community. If you try to go into that community and invite people to another group doing similar things, it's light enough to go that well. Having said that, there are many, many groups that are more just general groups about a specific topic. And I will use you to do these. I try to go into groups to have at least 500 members. I'm not too fast with we tom big the group is because I also think, you know, even if someone has a big number, like, you know, tens of thousands of people, they could have gotten that people in 10 years ago, they could have, you know, half of them might be fake accounts. They just buy a day, just bought to show off and things like that. So I don't think you should be too impressed by the number of people in the group, but it should be at least 500 people. Um, and yeah, try to avoid groups where there is a strong kind of semantic leader. Nick Hauser:	Have you found any group types to, to um, be a little local than indirect? So an example of this might be, if I'm helping, I'll do the weight loss example again. If I'm helping women lose weight, I might go to a facebook group that's just literally says like weight loss for women. And that's like a direct group in the indirect route, might be a, like a product or something else that's related to weight loss, but there may be women who have that problem in that group. Have you found any groups like that to be as effective as the direct ones? Patrizio Pezzutto:	Hard to say. I've never really thought it that way, a truly. Because I think some of these groups are so big and we end up really just using. I don't think we've ever really join more than 10 groups in each niche we've, uh, we've, um, worked with in. Um, so, um, so what I find is that ultimately there are so many people to add, even in just a few groups that, you know, I usually just find the groups when I began to process and never really feel the need to, to join more unless they pop up in the suggested columns or something like that. Uh, I think that's a good point. Yeah. I never really thought it that way. But I will say in general, yeah, I mean if, if, um, if the conversation is relevant to what you have to offer, I think it can always work out. I couldn't really answer your question based on my experience. Nick Hauser:	So let's transition now to people probably get a feel for what our conversation of what you're doing stuff, but who like who do you help and what do you help them do? Patrizio Pezzutto:	Yeah. So I help coaches who are in the early stage of their business needs so they could be in a position where they might not have any clients or they might just have a few clients they've usually found through word of mouth or personal connections. And what will tie you offer is a 90 day package. Oh, where I will help you, um, do everything we talked about basically. So I help you first of all really clarify and identify your niche because a lot of coaches to go out there with only a vague idea of who they want to help. So we have that conversation first, help you clarify your niche, your offer, and your message. And out of that conversation, we set up your facebook group and then what we do, we run your direct outreach on your behalf, so we use your account to, you know, join groups and attract people to your group. Patrizio Pezzutto:	And the, on top of that, what I also do, um, because this is something that I think is very important, uh, I helped you engage with your audience. So this came out of a, uh, of seeing Gary Vaynerchuk content model last year. If you ever come across, it's very cool a presentation and put together where it basically explains that most people create content just, you know, in the way that most people create content, you just create videos and post and all of that by actually explains that he actually creates one pillar of content which could be his keynote. And out of that pillar accountant, he extrapolates some key moments and he turns them into short videos, articles, infographics, memes, a podcast, and all of that. So out of one hour of work, theoretically he creates, you know, 50 pieces of content. Now, I really liked that idea, but I don't think it's so doable. Patrizio Pezzutto:	No relevant to someone who's just starting out as a coach. However, I thought that the principal was very, uh, adaptable to, to this industry. So what we do on a daily basis, we, uh, we, we help you, you know, set up a facebook live every week in your group before the facebook live. We actually get you to run a poll, uh, and uh, and ask a specific question to your audience and then based on the answers you get from that poll, we do the facebook live and we're, you know, I helped my clients have, might be on the facebook five or might just be in the comments helping them out. Once the facebook live happens, we actually transcribe it, uh, not manually. This assistance, uh, we transcribe it and then we repurpose it into an article and an infographic and a short Gary v videos. So with a big title subtype those, you know, the red bar that scrolls down the bottom. Patrizio Pezzutto:	And the idea is I only want my client to spend 20 minutes a week worrying about their content. We do the rest. So all day I have to do is to deliver this, you know, 10 to 20 minute call engage with their group, um, and uh, you know, show their face and give some value and then what we do, we repurpose it, as I said, two, three different types of content. We might also do the watch party as I said, so we did the watch party where we replay the facebook live and the idea is from my experience, if you do that, if you take the time to actually give people the chance to know you before you ask them on a call, then to call is so much easier. And the uh, as I said, it really helps you closing that person if they're interested. And uh, and so that's the full service. We do that on a 90 day basis to begin with. Of course, if they want to renew, we also continued and we provide that service on a, on a week to week basis. Nick Hauser:	So it's kind of like a done with you if you do some of the things and then they're responsible for the lives. And then also do they message back and forth with the people in my comment? Patrizio Pezzutto:	Uh, yeah. So it's, you're right. Is more of a done with you were they? Um, they really just need to give me the input, like what do they want to talk about and uh, you know, some ideas and opposite they need to run the facebook live. Um, but then again they're free to, to engage in their group and you know, add been a bit more content. Well we really focus on is obviously the initial conversation, you know, to get them into group. And then we also pick up the conversation if we see someone it gets particularly active in the group and we reengage with them a messenger ad at that point we might even get them to the call with our client. Nick Hauser:	Nice. And then the client has to show up and actually conduct the call and such. Patrizio Pezzutto:	Yeah. I mean, I'm not sure if I should talk about this, but my idea is eventually to be able to take care of, uh, of that no idea how the whole package to some extent I think it's good for someone who wants to be a coach to be able to sell their program. I think it will make them a better coach, but still I can see how with some people just don't want to do it or just, you know, rather have someone else to do it. So, but I, I still haven't figured out that part. Nick Hauser:	Yeah, a lot of coaches seemed that they just, you know, they love coaching and helping people and the other part's day they don't like as much or if they're new to it, they might have mixed emotions about it, like the selling thing and um, but that's a whole nother topic. Right. So you know, building out here too, they work with you for 90 days. And then is there anything else that you like, do you help them structure their facebook lives? I got to say portrayed CEO. Here's going to be the topic I want to talk about. Do you say, okay, you know, do a, do an intro about this and how do you help them on that end? Patrizio Pezzutto:	Well, it starts by discussing, first of all, I meet with my clients at least once a week usually. So we have this kind of conversations because it's always evolving. Um, and then we usually define one main topic and um, and that the reason why we started with the pole is, is because of what we were discussing about asking and listening before doing and speaking. So, you know, you might have this growing group of people bought the pole, really helps you understand what they want to learn and what they want to know. So that's why we always started with the pole and usually the poll gives you enough insight on what your audience is interested in to basie or facebook live off of. So, you know, you can ask what do you struggle the most when you tried to lose weight? And most people will say, I don't know, uh, I struggled not to eat chocolate. And then you can do the facebook live, especially on that specific thing. Nick Hauser:	Hey, February. That's a really relevant example. Valentine's Day chocolate. Patrizio Pezzutto:	Yeah. I guess actually I'm actually like doing the 30 day um, you know, no chocolate, no coffee thing. So that's, that's a different conversation. But Nick Hauser:	sticking it to your drinking, my coffee, the whole interview. Then Patrizio Pezzutto:	I could have a whole conversation about, you know, little little habits that I tried to change. Implement a bi. Yeah. From drinking coffee. Really it, it's really not that good when you try to focus on to any. Also could be myself and my body and my personality. But uh, Nick Hauser:	yeah. So like I, you help them with the facebook lives and then do you help them at all with their, their sales? Like they're responsible. I know at the moment you're not doing it for them, but they still have to do it right now. Do you coach them at all with that or do they just completely on their own? Patrizio Pezzutto:	Yeah, I mean ultimately I as long as much as it's a done for you, done with you service. Uh, I still see myself as a coach for them, so obviously if I see that we are consistently driving people to their group and they're consistently getting on calls, but none of them are converting, that could be the conversation we have a when we meet on a weekly basis, uh, to be honest. Right. The discipline, that's what we're thinking about how we helped him the most, you know, should I began teaching it, you know, because obviously I've done lots of sales calls and I've got a script. So that could be a thing, you know, like some sort of course or shall we stick to the dump for you thing possibly train people to become our sales team and then work on behalf of our coaches and if the. So would that be included in package to be a separate package a so that at that point I can definitely see the potential for it to be there at some point. I just don't know exactly how it's going to be. Like right now. Nick Hauser:	It's interesting. I think it depends on their goals too as a business cause like longterm or they're trying to really build a big business, like a lot of the people who work with an up level and stuff, they're trying to get to like 100 grand a month and while it may be great if we just did like all their sales goals for them, if they haven't done it themselves, it's very hard for them to go out and hire a sales team and then actively manage and iterate and coach and improve their own sales team to get them up to their level so they can step away and focus on maybe just coaching or building a better product or service. If somebody is just wants to be a coach and they want to, they're happy, like making 10 grand a month and they just want to coach and then when everything else happened for them, I think that's a different conversation. Nick Hauser:	I think it depends on the type of person you're helping him and what might be the best thing to do, you know, 100 percent. Um. Cool. So what's your, what's your visionary or too, so you've, you've gone through this, we've taken some really detailed step by step of your journey here and it was cool to see somebody who started out took action and then the by taking action figured out this wasn't for me, very important versus just you didn't do anything for six months and then said, all right, I'm going to start now. And then you've landed clients here and you're helping themselves like a problem. Um, with the organic garbage and such. What's the vision here over the next five years Patrizio Pezzutto:	for your business and what you're trying to do? It's interesting, when I think about my goals, they're usually financial, you know, I can't really see myself. I'm a do really have a vision that is not attached to a number. And um, my, the reason why I feel that you don't always sort of go back to the financial goal, it's because I feel finances as been such a struggle in my life and my family's life, my generation in my society. You know, that large, you know, these monitoring. It's always a pain in the neck. You know, so and so I'm so keen to get to a place where money I've been thinking you could really say it's not a problem anymore. I think, you know, you always have to deal with Bonnie, but their relationship with money is very different to the one I've seen, you know, most of my family, most of my friends, um, have, uh, you know, throughout my life. Patrizio Pezzutto:	So, um, so the goal purely financially would be to get to six figures in 2019 and seven figures in 20 slash 20. Having said that, high know that, you know, in my, you know, I know when I get there, I don't know how or how quickly I'm going gonna I'm going to get there and I'm not, I'm also not too attached to how long it takes to get there. Of course it'd been five years. I'm still at the same income as I have now. Then probably there's going to be a problem. But once again I tried to be as ambitious and realistic at the same time. So really my goals are more on a two year timeframe, uh, just because as send teachers, you know, your math can really help you figure out a lot themselves. So what they did, I asked myself, okay, if I wanted to get to six figures in 2019 and seven figures in 2020, how much should my revenue increased on a monthly basis over the next 24 month moms and the number of founders, 27 percent. Patrizio Pezzutto:	So if I can grow 27 percent consistently over the next 24 months, I'm going to have achieved that goal. Um, at the same time I can see how with our current model we can push it to a certain extent and we might be into struggle once we began having, you know, 15, 20 clients and Sam talks about that as well. So also really up level is going to be hard to have this picture some point and um, but yeah, that that's really my goal. And then look in like, you know, longterm. Then I would like to build something like, you know, like a truly big business could be like consulting.com or even by the big four, you know, um, but that will be something that I think I'm more concerned with getting into having that experience of starting a business, growing it to six, seven figures and then I can think about, you know, how do we take it to let you know, but that's going to be, you know, my, my life's journey the next 20, 30, 60 years. Possibly. So don't think about it too much, but it isn't the back of my mind for sure. Nick Hauser:	I'm glad you didn't answer my question. Like exactly. It's important because even like that video image mentioned earlier that Sam put out, you know, the first important thing is the cash flow. I think what a lot of people, you know, I think like an example of like facebook and like ducker, Bergen, that whole story, having this big vision from day one and getting like funding, um, it's easy. Like, you know, that's, you know, there's no other thing like facebook out there. And then the story of how it started in such. So that's like an anomaly and not that saying that if you're a sas company or something and you're, you're getting funny, that's a bad thing, but point is a cashflow is so important in the first initial stages of growth and such. So while you do one, maybe you have some idea of like what a longterm goal might be if you're just trying to hit that and you're not focusing on the like, you know, getting cash in your business so you can actually make some moves or hire people or do whatever it is. Then the ultimate we'll get there. So I'm glad you said that. It's a good thing that is good for other people to hear too, you know, Patrizio Pezzutto:	truly like life is his constant paradox in a way because while I have vision these goals and I truly believe we can do it at the same time I'm on the day to day basis, I'm much more concerned on our work, on our work and the work we do for our clients and the results we were helping our clients get. I'd rather stick to having five to 10 clients for next year, but making sure that I do my very best because sometimes also clients mess up and you know the deep or anything, so you can't expect to have like 100 percent retention rate, 100 percent satisfaction rate, but you know, I'd rather stick to this model and truly understand how we can best deliver our service and get our clients results in gradually grow. Then doing the opposite because I, I don't think it's a good idea to scale before you have some sound proof of concept a because you might scale, but first of all your profits are going to be low because there are lots of people are gonna ask for refunds or you know, not continue the way you're just building business and at the same time growing audience of people that don't like or haven't liked your survey. Patrizio Pezzutto:	So I haven't had a good experience with your service and all of that. Just to say I made a million bucks. I don't think that's a good way of doing it. So it's a constant balance. You know, how, how much can you push on the throttle and how much you need to stop Chicago in the car is still one piece. Nick Hauser:	That's a great question. A lot of people ask, you know, when should I start ads run, should I scale and what I would say like on the coaching calls and searches, it's like front end and back end proof of concept. Like it's not just, it is one, a whole proof of God set because that's what we say in the training, right? Get proof of concept then do ads, but it's, there's two pieces to that because like you're saying here, you don't want to scale like you know, a, like if a house has terrible foundation, do you want to scale a business? Poor foundations and what we've seen a lot of times like in the online marketing space is that a lot of people, they're really great at speaking and talking and marketing promoing things. That's like the front end, like they had the messaging to communicate to their niche. Nick Hauser:	They know how to close them, they know what to get them on the phone, but that's like the front end proof of concept. The back end is like you're saying here, getting them to the results and focusing on that because you could be the. If you're the best promoter and speaker in the best front end proof of concept person. Once you go to ads, you can land people, but eventually, like you're saying, people will churn and eventually that thing will just die. Burst if like you're saying, I'm going to be patient, I'm going to take my time here and that will ultimately help you. Once you decided to go to ads and when you decide to make a program and help people, you'll have every little intricate detail and troubleshooting ability ready for them. Where are you going to provide them the best value and you'll, you'll crush everyone else who trying to go too fast. Um, yeah. Good strategy. Patrizio Pezzutto:	Yeah, I understood thing the, is it a nine inconvenient truths detail that Sam did a few months ago? I honestly think that's possibly the best video on online marketing I've ever seen in a public form. Of course, the content in accelerator is great, but I really don't think that message it's been shared. And uh, one of the things that one of my early mentors said, um, is there one thing is to create success for yourself, you know, helping out or that same success is a completely different business. You know. So that's what I'm. And I think it's gonna, um, you know, lay the foundations as you were saying too much more so than business because ultimately it's a lot of work. So I don't want to have to do it. I want to do it once, but you know, I want to be a one business. I don't want that business to be great. And as I said, you know, to get to, you know, take it wherever I want to take it. I don't want to keep on reinventing my business because the previous one got me a lot of money on the front end, but then everyone else for a refund and uh, and on top of that, thousands of evil, now I hate my face. Right? So Nick Hauser:	yeah. It's like if you're a plumber and you knew everyone liked, needed their toilets fixed and you just like, you knew that they knew that was the big problem. So you went and sold a bunch of things, but then you, like, you didn't know how to fix the toilet or you have morning willing to figure it out at that point. Then everyone would be like, what the hell this guy, because he can even fix the. So that's what happens. I'm closing out here too. What would your number one piece of advice be for a member who is just starting out with the program? Patrizio Pezzutto:	I think it will be. Let go of how you think it's gonna look like I everything your business, your life the next year, the next five years, um, everything you know, because does the greatest gift you can give to yourself because it leaves you truly open to receive all that you're going to receive on this journey and get accelerator is going to be a big part of it, but it's only going to be one part. And the worst thing you can do is to think, you know, how long it needs to take or what it's gonna look like or you know, worse. I know what product people need or I know what niche I'm going to be in. And um, yeah, that's, that's my number one advice. Nice. Nick Hauser:	Where can people find out more, you know, more about you online Patrizio Pezzutto:	right at this moment. A join my facebook group because um, you know, very much. I mean, I do have a website you want to zip it suits, uh, dot com. Uh, but I will, if you really want to get in touch with me, just join a ged, high quality coaching clients on facebook. That's my facebook group. And that's really where I'm the most active and we can interact and you know, you can see what I'm doing everyday. Nick Hauser:	Awesome. It's been a pleasure speaking with you and likewise. Yeah, it's great. It's great to see like how I mentioned earlier in the call and even before we were talking, no, it's no doubt great going doing interviews with people who have had like a large amount of success but a lot of the times, um, it's over a course of a few years to get up to, you know, making a million dollars a month, 500 grand a month, 100 grand a month. It takes people different amounts of time. So those interviews, they're super insightful, but sometimes you can't, you don't have enough time to dig into every single piece here like we're doing and some of the early struggles or pivot you made and why you did it. And for people who just starting out or people are thinking about starting a business, you know, what we shared here is, is also very valuable to them because it's very real raw and practical for the beginner. So appreciate your insights. And what you've been doing and look forward to seeing. Just get us moving forward. Patrizio Pezzutto:	Thank you. It's been a pleasure for me to speak at Riverdale to say it.